Recently, our head of kitchen R&D, Meredyth Haas, traveled to Tokyo with Chef Lisa to visit the pastry team at Dandelion Chocolate Japan. 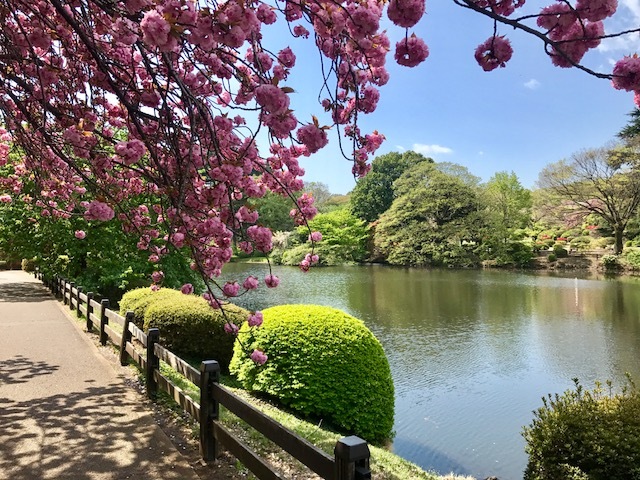 Below, she tells us a little about workshopping pastries, and what makes Tokyo so different (and not so different) from home. 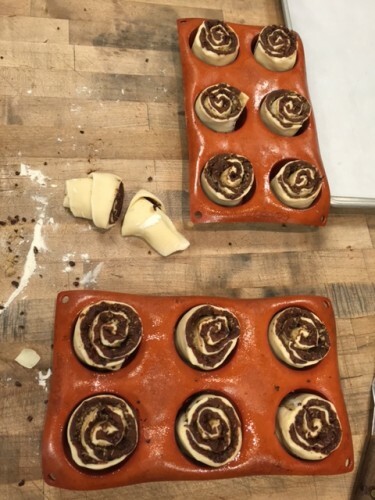 At our factory in San Francisco, our pastry menu changes every few weeks. New things come into season, and we love keeping things fresh and working through all the ideas on our back burner (which is a very full back burner). The pastry kitchen at Dandelion Chocolate Japan in Tokyo serves more or less the same menu, but their ingredients and techniques are a little different over there. So this past April, Chef Mai invited Lisa and I to the Tokyo kitchen to spend some time workshopping pastries and updating the menu. We hopped on a plane with seven new pastry recipes in our pockets and a suitcase filled with canelé molds and aprons. We boarded our 13-hour flight with nervous energy and anticipation. So far from home, but so much like home. Tokyo is more than 5,000 miles from San Francisco, but stepping into DCJ for the first time felt a lot like home. The distinct scent of chocolate, sounds of the roaster and winnower, English descriptions of the chocolate making process on the walls, and the same Japanese-made ceramics being used in the café made the space feel familiar. I immediately felt at ease despite not being able to communicate much beyond the occasional smile and awkward head bow. After meeting some of the café and kitchen staff, Lisa and I checked into our nearby Airbnb and prepared for a week of work ahead in the kitchen. 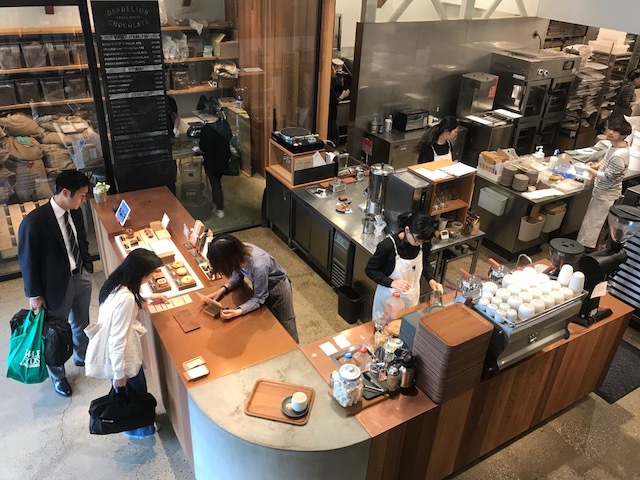 Just as we have two pastry kitchens here in San Francisco (one on Valencia Street and an upcoming one on Alabama Street), DCJ has two pastry kitchens in Tokyo. Lisa and I worked at Honjo, which is their external factory location. There are many, many differences between the DCJ kitchen and ours back in California. Some I noticed right away, like the windows (our kitchen is windowless)! A full gas range (we use induction burners)! A walk-in refrigerator (we only have reach-ins)! A sheeter (machine used to roll large batches of dough and make laminated pastries like croissants)! Upon closer inspection, I noticed their ingredients were also different. They don’t use brown sugar, the egg yolks are a different orange, the butter has a higher water content, and the flour was more pillowy and less dense. Their kitchen had temperature-controlled cabinets to keep chocolate melted or in temper. 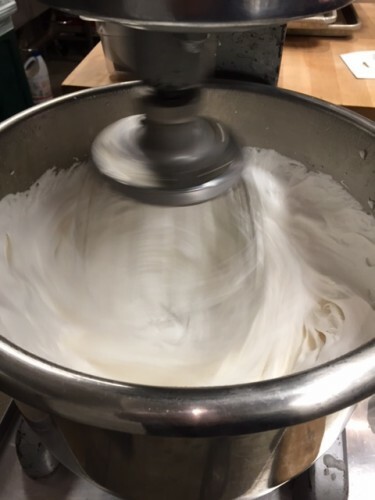 Their stand mixer was twice the size of ours, enabling them to make enormous batches of marshmallows at once. Their oven fan had six different settings, compared to the simple choice I make every day: On or Off. It took me a while to learn the flow of production in their kitchen. The team had one pastry assistant on staff who knew some English and was able to translate some for us. Other than that, there were a lot of hand gestures and laughter as we tried to communicate, but we managed. Luckily for me—since the only Japanese phrases I know so far are “I’m lost” and “ramen please”—teaching our new pastry recipes to the Honjo team is largely a visual exercise. 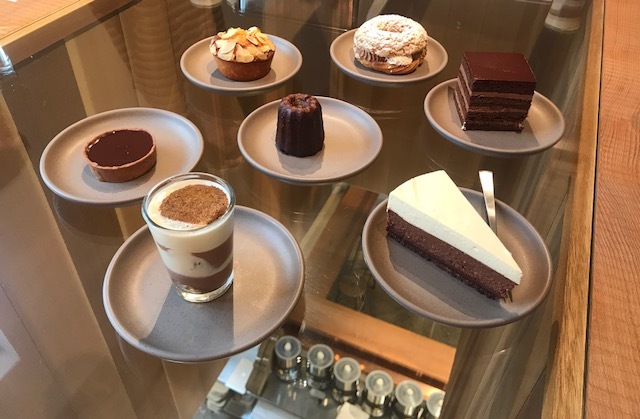 We spent the week workshopping our tiramisu, bourbon caramel tart, almond tea cake, mocha paris-brest, celebration cake, yuzu chocolate cheesecake, and canelé. After five days, Lisa and I spent the weekend in Kyoto, and the Honjo team buckled down, mastering the new recipes. By the next week, they’d mastered each and every one beyond a level of perfection I would have ever anticipated (especially considering we couldn’t even really talk to each other!). Tokyo is a really exciting place to be a visiting pastry chef. Some of the world’s most well-known pastry shops have branches in Tokyo, including Pierre Hermé, Bubo, Dominique Ansel, Pierre Marcolini, Ladurée, Jean-Paul Hévin, and Janice Wong. It was interesting to see how international brands brought their specific aesthetic to a cosmopolitan city like Tokyo. I ate some really incredible pastries, but I have to admit, it’s the savory food that really blew my mind. I had the best sushi of my life at a 15-course Omakase in Ise, and ate tuna sliced and served to me within hours of being caught at the famous Tsukiji Fish market. I ate fresh uni out of the shell, waited two hours for Michelin-starred ramen (worth it! ), had pork katsu cut by a 100-year-old zen master chef, and copious amounts of matcha soft serve. On our weekend, Lisa and I spent the day at a traditional Japanese onsen, relaxing in an outdoor spring overlooking the Kyoto foothills. It was a surreal experience watching our pastries come to life on the other side of the world. Though ingredients and kitchen equipment and units of measure may differ across countries, the joy of eating delicious food is a universal experience, and it’s a joy to be reminded of that so far from home. Thank you, DCJ! Tucked in the back corner of our factory on Valencia street, through double doors leading down a narrow hallway, lies a 12×12 foot tiled room, the contents and activities of which are largely unseen and perpetually enveloped by the sweet nutty scent of browning butter and baking brownies. 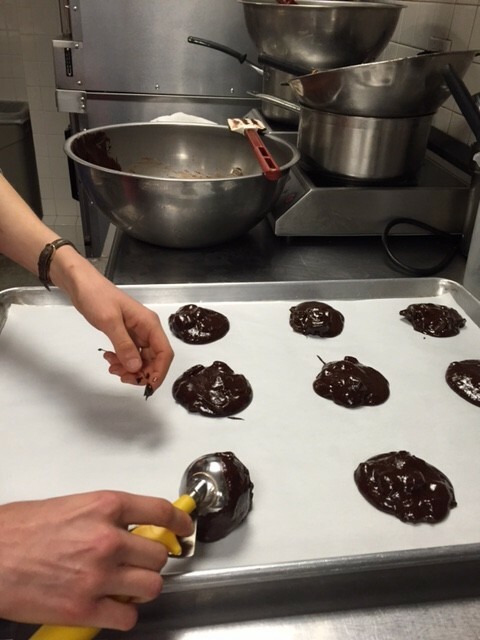 This is the Dandelion Chocolate kitchen. 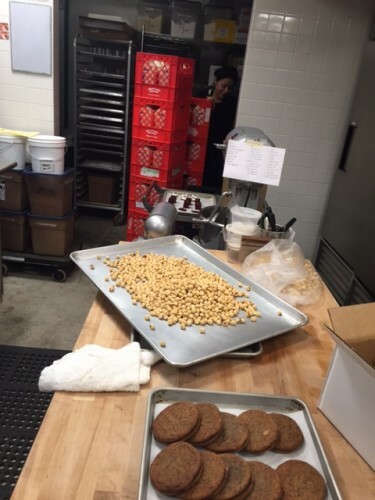 While visitors can watch the production team sort beans, crack, winnow, temper, and wrap bars in our open factory space, the process of making pastries is less visible. As a member of our small but mighty pastry team, I can assure you the days are long, the pace is fast, and the work is tiring. Each week, our team produces and sells over 1800 pastries, 1200 marshmallows, and 47 gallons of hot chocolate. Nothing compares, however, to the adrenaline rush of a busy Saturday stocking the café with fresh treats. Here at Dandelion, Saturday is gameday: a attempt to satisfy the deluge of locals, tourists, regulars, first dates, families, and anyone else seeking a chocolate fix on a weekend afternoon. 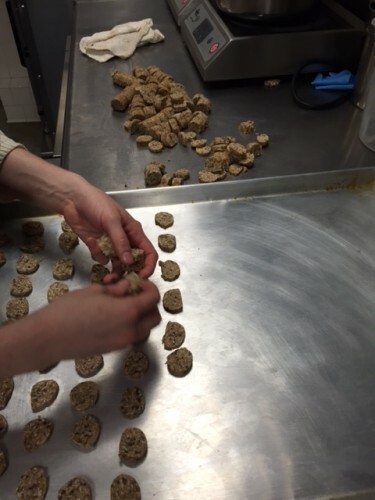 What follows is an account of what a busy Saturday looks like for the Dandelion kitchen. Valencia Street is deserted. I unlock the front door and see that Lisa, our executive pastry chef, has already arrived. Mary, Dandelion’s other pastry assistant, walks in right behind me. Aprons on. Ovens on. Towels folded and stacked. Sanitizer bucket filled. Production list double-checked, tasks assigned, and taped to the back of the Hobart mixer. Nibbun dough and marshmallows pulled from the fridge. Let the morning bake begin! First in the oven go brownies, Nutella-stuffed cookies, malt cookies, tart shells, and graham cracker squares. Mary puts the European Drinking chocolate on a double boiler, and pulls logs of nibby oatmeal cookie dough from the freezer to cut (these are the small cookies we serve with every drink). 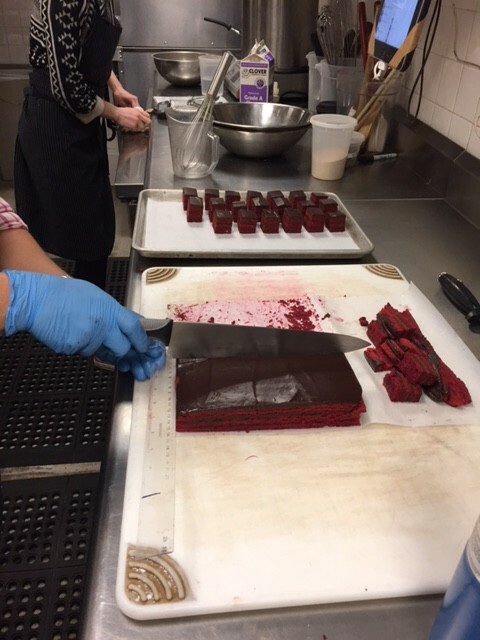 I start making a triple batch of our Double Shot espresso cookie, and Lisa cuts small squares of red velvet beet cake. Our first round bake is done, and the kitchen island is open for bun business! Mary rolls out the dough, which has risen overnight in the fridge. 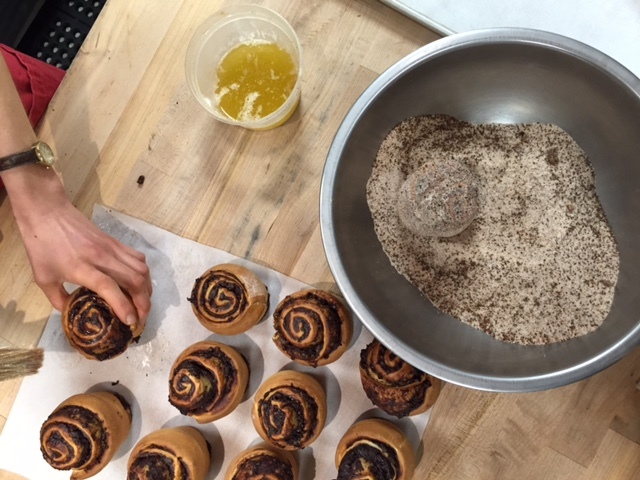 She spreads it with chocolate custard, brown sugar, nibs, and starts rolling. Meanwhile, Lisa fills tart shells with coconut ganache and lime filling, and prepares the rest of the components of the Chef’s Tasting menu. 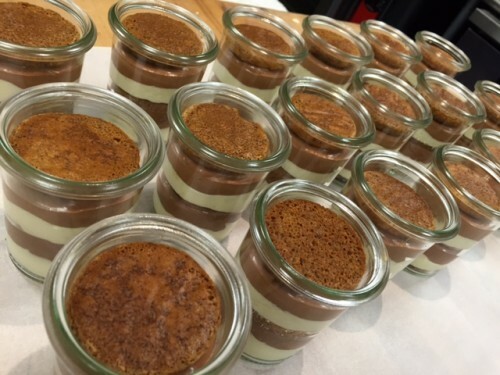 Nib tuile is baked, panna cotta and PBJ cups are portioned, and mini s’mores are assembled. Nibbuns, now rolled and sliced, are set on top of the oven to proof. I spread malt cookies with malt ganache, and top each graham cracker with a fluffy square marshmallow that we piped into silicone molds the day before. Mary makes a quick batch of mascarpone cream, a cloudlike blend of mascarpone, sugar, and egg yolks gently folded into a french meringue. She dips each circular ladyfinger in decaf espresso and layers soaked cookies, chocolate cremeux, and mascarpone cream into each Weck jar. Lisa weighs each three ounce portion of toffee, preparing at least four trays for what we’re all convinced is going to be the busiest Saturday yet. We each make predictions for that day’s sales, based on factors like weather, time of the year, nearby festivals, and just that general gut feeling—Lisa’s got a knack for predicting our busy days, and she’s pretty convinced today will be nuts. Bring it on! Thirty minutes to opening means it’s almost showtime. At this point Nibbuns are in the oven and every pastry receives its final touch-up. Tarts are garnished, smores are filled with ganache, dulce de leche bars are salted, and tiramisus are dusted with chocolate. I open the freezer to see how many frozen praline mousses we’ve got to start, hoping we didn’t sell out last night. Luckily, six jars remain in the hotel pan. I check the production list and Mary is in charge of making mousse today. I put a star next to it so she knows that project should take priority. Mary quickly butters and sugars the Nibbuns and I bring up the European drinking chocolate before we officially open at 10:00am. Coffee! One of our opening barista rockstars delivers two pour overs and a cappuccino to the kitchen. The adrenaline that fueled the two-hour morning bake is happily replaced with caffeine. While scarfing down hard boiled eggs or a cup of yogurt, we each review our production lists. I mentally organize my day based on prioritization, kitchen space, and equipment required for certain tasks, and appropriately timing projects that require several steps. With production in full swing, these next few hours are our most efficient. Before the line is out the door later in the day, we focus on longer-term projects to stock up for the days ahead, such as brownie batters, graham cracker dough, chocolate syrup, candied nibs, and custards. We hear a familiar chime and receive our first message of the day on our iPad; we read that someone just bought 25 Double Shot cookies for a party. Mary grabs the espresso powder from the pantry shelf, and I know she’s already on top of making another batch. Our kitchen iPad, which hangs from a pastry shelf under the measuring cups, is the kitchen’s lifeline for several reasons. First, it plays our much needed Justin Timberlake albums, Yacht Rock Pandora mix, or NPR to ensure maximum kitchen efficiency. More important is its main function as a communication tool with front-of-house staff. They text us when they are running low on a certain pastry or drink so we can restock their supply, and we text them with updates of when a item we’re preparing might be ready to sell. In the middle of scaling out malt dough, I open the lid of our baking soda container to find a measly pinch at the bottom, and no back-up bin on the pantry shelf. One of us has to go buy some– we need this dough for tomorrow. Lisa offers to run to our local market, Bi-Rite, for baking soda and lunch. Now is as good a time as any to take a short break. Fueled by Bi-Rite sandwiches (try the Vegan Hippy!) scarfed down in our aprons on the mezzanine stairs, we return to the kitchen to find more messages on the iPad from the café (“8 Nutella cookies! 4 Brownie flights! Any Nib Infused Whip Cream back there?”). It’s that time of day when things really start getting crazy– the growing line of customers likely won’t disappear until we lock the doors nine hours from now. “Out of marshmallows!” the iPad reads. “Double Euro please! Someone bought all the toffee!” quickly follows. Inevitably, the timing couldn’t be any more inconvenient. To heat another batch of European drinking chocolate, we’ll need a third burner, and all three are currently being used for time consuming projects: I’m boiling sugar syrup to make marshmallows, Mary is stirring a large pot of sugar, butter, and sweetened condensed milk to make dulce de leche, and Lisa is tempering chocolate, which requires heating and cooling chocolate to exact temperatures. Every work surface is covered: sheets of toffee, marshmallow molds, bowls of flour and eggs, kitchen scales and thermometers cover every surface. Right when my marshmallow syrup reaches 261° exactly, I lift the pot from the burner, yelling the requisite “hot pot behind!” as I bring it to the Hobart mixer and stream it into the whipping egg whites. At the same moment, Lisa’s chocolate has reached 34° and she immediately spreads the chocolate onto a full sheet tray of toffee, working quickly while the chocolate is in temper. The dulce de leche Mary has been stirring for the past 25 minutes finally reaches the right thickness and she uses a spatula to spread it onto three baked crusts. After a minute or two of whipping, my marshmallow has reached maximum volume and I pull the large bowl from the mixer, fill piping bags with the warm white goop, and start filling molds, working quickly before the marshmallow stiffens inside the bags. At this exact moment, a shoulder-high delivery of milk arrives at the door of the kitchen, a timer goes off, and we notice the dishwashing machine has flooded again. Never a dull moment in the Dandelion kitchen! At this point in the day, major production projects have been completed. 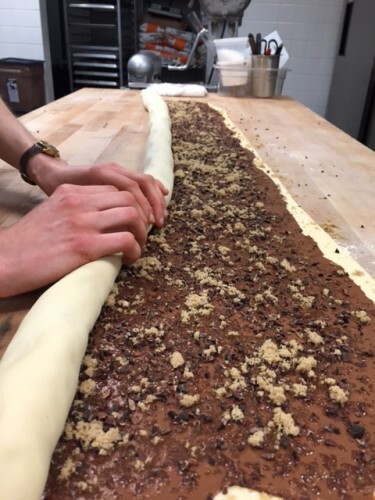 We’re working on a large second bake to stock the cafe with enough pastries to sell until 10pm closing: 35 more Nutella, 15 more malt cookies, 11 more brownie flights, and a few more sliced logs of free treats go in the oven. 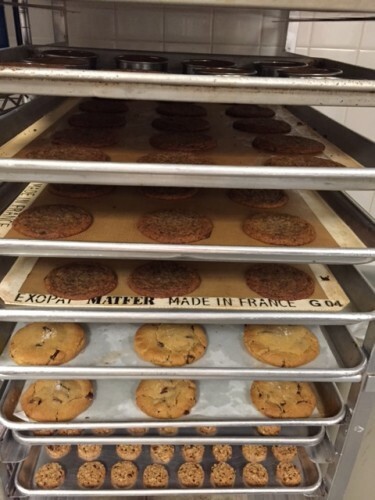 We bring up the fresh cookies and brownies, and weigh four more trays of toffee for the cafe. Lisa writes a production list for tomorrow, Mary writes a list of available backup pastries on our kitchen dry erase board, and I cut half sheets of parchment, refill salt and vanilla extract containers, and wrap, label, and date everything. I see we’re running low on cinnamon, and add it to our pantry order list. Then—at last—it’s time to scrub down. All surfaces, doors, and appliances in the kitchen get a hot, soapy bath, followed by a towel dry. We take out the trash, sweep the floors, and hand wash our chocolate-and-marshmallow-spattered aprons. Before hopping on my bike to meet friends for dinner, I grab a warm Nutella-stuffed cookie from behind the counter, and take a large, gooey, deeply satisfying bite. Despite being constantly surrounded by chocolate, sugar, butter and the treats created from their divine fusion, I still—without exception—eat dessert every single day, and today I’m eating it first.